It's time to start thinking about this year's harvest! Includes a 48-page activity book with cool facts, puzzles, and games, plus punch-out characters, reusable stickers, and a fold-out barnyard scene. Welcome to the rustic, sunny farm! Have you ever wondered what life is like on the farm? Find out with this fun and sunny interactive activity book! Unfold this book, and there's your stand-up play scene. Customize your farm with the reusable stickers and punch-out, stand-up characters, and you're ready for action. What kinds of animals you have on your farm and what you grow is up to you! Gather eggs, feed the pigs, milk the cows, plant the crops; it's never a dull day on the farm! 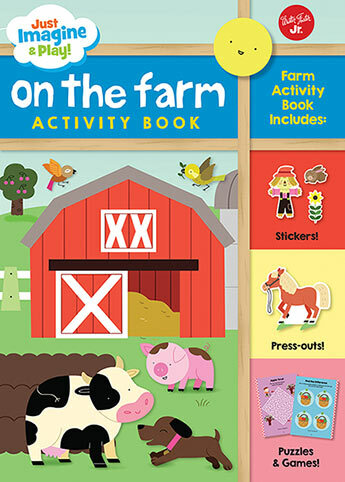 Includes a 48-page activity book with cool facts about farm vehicles and animals, puzzles, and games, plus punch-out characters, reusable stickers, and a fold-out barnyard scene. Melisande Luthringer always wanted to be an illustrator or an astronaut. This explains why, when she isn't drawing, she has her head in the clouds. She works mainly in advertising and editorial illustration with occasional children's commissions, which she loves the most.